Difference between revisions of "Veterinary"
In the absence of a player with the appropriate level of skill to revive your pet you can use an NPC veterinarian. 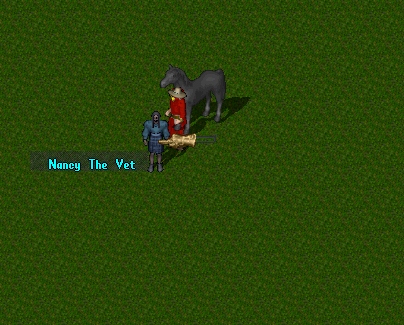 * In the absence of a player with the appropriate level of skill to revive your pet you can use an NPC veterinarian. To do this, you will need to find an NPC veterinarian, and then double click them to revive your bonded pet. There is a cost of 1,000 gold coins. An alchemist can also brew a potion called a pet resurrection potion using an Artisan's Mortar and Pestle. They would also need the corresponding recipe, which can be earned with craft coins, or found throughout the world in dungeons as loot, or treasure chests. * An alchemist can also brew a potion called a pet resurrection potion using an Artisan's Mortar and Pestle. They would also need the corresponding recipe, which can be earned with craft coins, or found throughout the world in dungeons as loot, or treasure chests. As ferocious as your tamed pet may be, at some point you may find yourself in a situation where a beloved pet is hurt, poisoned or both. With an investment in the Veterinary skill, you can heal most any ailment your pet may face. Although creatures can be sustained to some extent by magical spells, a well trained vet can heal larger amounts of damage at greater speed. Like Stable Masters, a player character vet is capable of resurrecting dead pets. Veterinary also counts towards your total stable slot limit. Dexterity no longer effects the speed of your Veterinary skill. Vetting bandages take 2 seconds regardless of healer's stats. In order to heal creatures you must use a pile of Bandages on them. Your Healing and Anatomy skills have no influence here, Veterinary and Animal Lore are used instead. As these two skills rise the amount of damage healed increases as does your chance to cure/resurrect if need be. Veterinary and Animal Lore are required to cure pets with bandages. 80 Veterinary and 80 Animal Lore to have a chance to Resurrect a bonded pet. You must be standing directly beside it. At that point you will receive a prompt, which requires you to select 'Yes' and your pet will be revived. The most basic method and perhaps the simplest and safest on UORP is as follows. Get two creatures dependent on your skill level. If you can't keep them alive, you'll have to get one that deals weaker damage. You'll want to do this outside of town. Have them fight each other. Immediately tell the one you want to be healing to follow you. This will prevent it from retaliating. Have your macro healing it every 2100 milliseconds. I prefer to train this way beside water in which to wash bandages. The attacking pet's skills will raise as you do this, and so if it seems easy at first don't worry it will scale faster than you. This is also the best way to train bonded pets at higher levels. 0 - 30: Train at a NPC Stablemaster. 30 - 60: Heal creatures. If you don't have Animal Lore the only way to train to 100 or higher is by healing. Otherwise you can continue below. 60 - 80: Cure a poisoned creature (need 60 Animal Lore). 80 - 120: Resurrect your dead pet but don't press OK (need 80 Animal Lore). <<---(Don't know what to put here but if you res your own pet, it auto accepts the res). I just get two weak creatures, (like deers or cows)and have them attack each other, then heal them. They do little damage to each other but you still get Vet gains. You must be in a guild if you do this in tram. You can do it in your own house. This page was last modified on 28 December 2016, at 20:23.